My brothers and sisters, as requested by President Benson, I shall now present to you the General Authorities and general officers of the Church for your sustaining vote. It is proposed that we sustain President Ezra Taft Benson as prophet, seer, and revelator and President of The Church of Jesus Christ of Latter-day Saints; Gordon B. Hinckley as First Counselor in the First Presidency; and Thomas S. Monson as Second Counselor in the First Presidency. Those in favor may manifest it. Those opposed may manifest it. It is proposed that we sustain President Howard W. Hunter as President of the Council of the Twelve Apostles and the following as members of that Council: Howard W. Hunter, Boyd K. Packer, Marvin J. Ashton, L. Tom Perry, David B. Haight, James E. Faust, Neal A. Maxwell, Russell M. Nelson, Dallin H. Oaks, M. Russell Ballard, Joseph B. Wirthlin, and Richard G. Scott. Those in favor, please manifest it. Any opposed may so manifest it. It is proposed that we sustain the Counselors in the First Presidency and the Twelve Apostles as prophets, seers, and revelators. All in favor, please manifest it. Contrary, if there be any, by the same sign. It is proposed that we release Elders Wm. Grant Bangerter and Hugh W. Pinnock as members of the Presidency of the Quorums of Seventy. Those who wish to extend a vote of appreciation to these Brethren for their faithful service may do so by the uplifted hand. It is proposed that we sustain as Presidents of the Quorums of the Seventy: Elders Dean L. Larsen, Marion D. Hanks, Robert L. Backman, James M. Paramore, J. Richard Clarke, Rex D. Pinegar, and Carlos E. Asay. All in favor may manifest it. Any opposed. At the October 1978 general conference, several of the General Authorities were given emeritus status. At that time the announcement was also made that additional members of the General Authorities would be so designated from time to time. Today, in consideration of factors of age and health, it is proposed that we sustain the following as Emeritus members of the First Quorum of the Seventy with a vote of thanks for their faithful and effective service: Elders Theodore M. Burton, Robert L. Simpson, Victor L. Brown, Paul H. Dunn, J. Thomas Fyans, Wm. Grant Bangerter, Royden G. Derrick, and Rex C. Reeve. Those in favor, please manifest it. 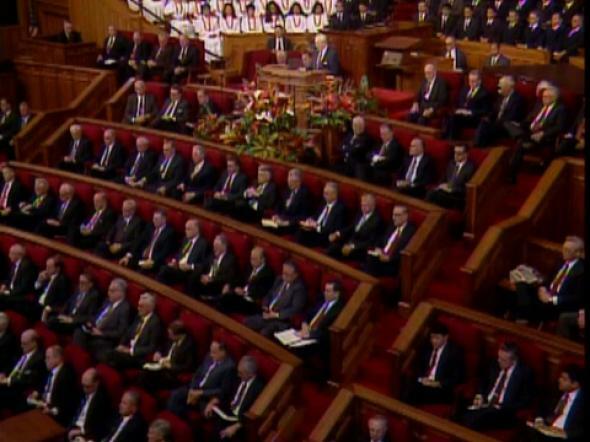 When the Second Quorum of the Seventy was established in April 1989, the initial membership of the Second Quorum of the Seventy was composed of General Authorities currently serving under a five-year call. It is accordingly proposed that we release with sincere appreciation for their devoted service the following members of the Second Quorum of the Seventy: Elders Russell C. Taylor, Robert B. Harbertson, Devere Harris, Spencer H. Osborn, Philip T. Sonntag, John Sonnenberg, F. Arthur Kay, and Keith W. Wilcox. Those in favor of an expression of gratitude to these Brethren, please indicate by the uplifted hand. It is proposed that we release with a vote of thanks Elders Robert L. Simpson, Devere Harris, and Derek A. Cuthbert as the Sunday School General Presidency. Those in favor, with an expression of appreciation, may indicate. It is proposed that we sustain Elders Hugh W. Pinnock, Derek A. Cuthbert, and Ted E. Brewerton as the Sunday School General Presidency. Those in favor, please manifest it. Any opposed, by the same sign. It is proposed that we release with a vote of thanks Elder Rex D. Pinegar as First Counselor and Elder Robert B. Harbertson as Second Counselor in the Young Men General Presidency. Those who wish to voice their appreciation may so indicate it. It is proposed that we sustain Elder Jeffrey R. Holland as First Counselor and Elder Monte J. Brough as Second Counselor in the Young Men General Presidency. It is proposed that we sustain the other General Authorities and general officers of the Church as presently constituted. All in favor, please manifest it. Any opposed may manifest it. President Benson, it appears that the voting has been unanimous in the affirmative.